During the Second World War, Canadian nickel was in great demand as a war material. This forced the temporary abandonment of its use in the coining of five-cent pieces. The first substitute material employed was a type of brass, called tombac. To aid in distinguishing them from the bronze one-cent coins, the new yellow five-cent pieces were given a dodecagonal or 12-sided, shape. 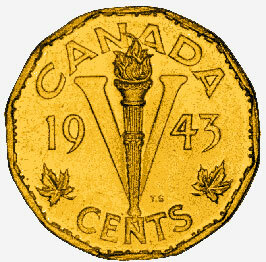 The new coins, designed by Thomas Shingles, the Chief Engraver at the Royal Canadian Mint, were introduced in 1943. On the reverse side, the traditional design of a beaver was replaced by a new special design with a patriotic motif. The large V featured in the centre stood both for five (cents) and for victory. To further enhance the impact of the design, the usual rim beads were replaced by an international code message of dots and dashes reading: "We win when we work willingly." The same design was continued for the duration of the war, although in 1944-45 chromium-plated steel was used instead of tombac. The coin is made of tombac and is in the National Currency Collection, Bank of Canada.